TweetReach, the Twitter analytics tool has announced its Academy Awards Twitter Explorer which gives a little bit of insight into which actors, movies, and directors generated the most buzz during the Academy Awards last night. The tool, divided into each nomination category, allows you to get a closer look at who got the most mentions, when, and exactly how many mentions they got. 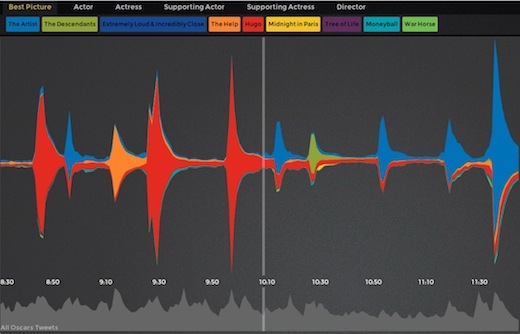 TweetReach also lets us know, not only which movies were the most popular among the Twitter TV audience, but also which moment created the most noise on the social network. In the number one spot was the Circque du Soleil performance, with 18,718 tweets generated in one minute. It was followed by Octavia Spencer’s win as Best Supporting Actress. The film Hugo’s win for Best Visual Effects came in at number 3, followed by Meryl Streep’s win at number 4. A couple of non-movie related moments that caught Twitter’s attention included Jennifer Lopez’s wardrobe malfunction and Angelina Jolie’s pose, each of which have now got their own Twitter accounts to boot. The full list can be seen here. So how many tweets were there all in all for the Oscars? For the three hour duration of the show, TweetReach tracked over 2 million tweets about the Oscars, one and a half times more than last year’s 1.27 million tweets. Of course, in comparison to statistics we’ve seen from Twitter in the past, including 8,868 tweets per second during the VMAs last year, when Beyonce revealed she was pregnant, the Oscar buzz was pretty timid. TweetReach managed to keep track of all of the buzz by keeping tabs on all tweets about the Academy Awards from 8:30pm EST to 11:30pm EST, as well as keeping an eye on the #Oscars hashtag, the official @TheAcademy account, and any mentions of the Oscars and the Academy Awards.